New Delhi: In the wake of Republic Day parade full dress rehearsal, the Delhi Police has issued a traffic advisory suggesting general commuters and motorists the roads and routes to avoid from Wednesday till January 26. The Parade rehearsal will start at 9.50 AM from Vijay Chowk and will proceed to Red Fort. For smooth conduct of the Parade along the route, elaborate traffic arrangements and restrictions have been put in place. To ensure smooth movement of the traffic, the people are advised to avoid Vijay Chowk-Rajpath, C-Hexagon Outer Road up to Tilak Marg-Bahadur Shah Zafar Marg-Netaji Subhash Marg via Red Fort. “No traffic movement will be allowed on Rajpath from 11 PM on Tuesday on Rafi Marg, Janpath and Man Singh Road till the parade is over. C-Hexagon at India Gate will be closed for traffic from 9 AM on Wednesday till the parade crosses Tilak Marg,” Joint Commissioner of Police Alok Kumar said. “Traffic advisory suggested alternatives roads that motorists can follow as North and South corridor that includes Ring Road, Ashram Chowk, Sarai Kale Khan, IP Flyover for going Rajghat via Ring Road. For going Mandir Marg, commuters can take route from Madarsa, Lodhi Road T-point via Aurobindo Marg, AIIMS Chowk, Ring Road-Daula Kaun and Shankar Road,” the officer said. “There is East and West corridor for motorists who have been suggested to take Ring Road via Bhairon Road at Mathura Road and Lodhi Road. For going AIIMS Chowk, commuters can take Ring Road-Dhaula Kaun via Mandir Marg. For going Ring Road-ISBT, motorists can take Chadgi Ram Akhara via IP College and Mall road via Azadpur and Punjabi Bagh,” he added. 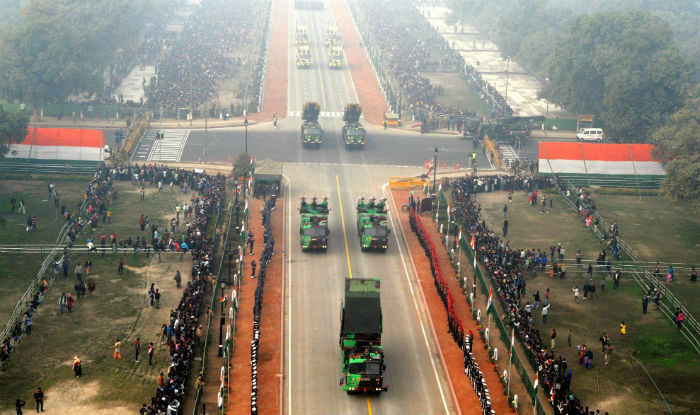 On Republic Day 2019, the parade will start at 9.50 am from Vijay Chowk to Red Fort ground. No traffic will be allowed on Rajpath from Vijay Chowk to India Gate from Janaury 25 till the parade is over. “From 10 am on January 26, traffic on Tilak Marg, BSZ Marg and Subhash Marg will not be allowed in both directions. Cross traffic will be allowed depending upon the movement of the parade,” he added. “Flying of sub-conventional aerial platforms like para-gliders, para motors, hang gliders, UAVs, UASs, microlight aircraft, remotely-piloted aircraft, hot air balloons, small-size powered aircraft, quadcopters or para jumping from aircraft and the likes are prohibited over the jurisdiction of National Capital Territory of Delhi from January 9 till February 9,” the officer added.